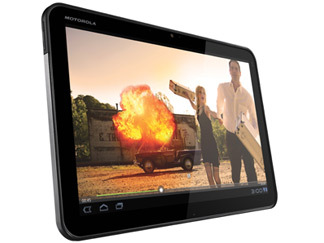 Motorola(s mmi) officially announced on Wednesday that it’s now upgrading its Xoom Wi-Fi tablets to the Ice Cream Sandwich version of Android(s goog), effective immediately. Version 4.0.3 will be an over-the-air software upgrade, in stages, for all current Xoom tablet owners. It makes sense for the Xoom to see Ice Cream Sandwich before other tablets on the market.The device offers a “pure Google Experience” and was the tablet used to show off Android 3.0, also known as Honeycomb, at the 2011 Consumer Electronics Show. My own use of the Xoom with Honeycomb showed a tablet and operating system rushed to market; it took several months for key software and hardware features to arrive on the device. Even though I have concerns about the inconsistency of Android 4.0 on a tablet compared to phones, the overall Android experience should be much better on the Xoom with the updated software. Xoom updated this morning. Locked mine up. Wife’s unit is fine. Having used ICS on the Xoom wifi for several days, I find the update underwhelming. There are some improvements (smoother home screen scrolling), some things I don’t care for (greater social integration), and some ongoing bugs (browser crashes, battery drain). Overall, I think people will be excited by the update, but it doesn’t really do much to make the Xoom the tablet it could have been. Google’s direction in terms of end user experience is, now, different enough from my own direction that the update is pretty useless. It really does nothing to make the Xoom the device it could have been. Having waited for ICS before deciding to root/unlock, that’s precisely what I’ll be doing.